Costa Rica is a rugged, rainforested Central American country with coastlines on the Caribbean and Pacific. Though its capital, San Jose, is home to cultural institutions like the Pre-Columbian Gold Museum, Costa Rica is known for its beaches, volcanoes, and biodiversity. If marketing experts could draw up an ideal destination, Costa Rica might be it. The 'rich coast' has earned its name and stands apart from its Central American neighbors on the cutting edge of so many trends: surfing, farm-to-table restaurants, and sustainable tourism. Rainforest hikes and brisk high-altitude trails, rushing white-water rapids and warm-water, world-class surfing: Costa Rica offers a dizzying suite of outdoor adventures in every shape and size - from the squeal-inducing rush of a canopy zipline to a sun-dazed afternoon at the beach. National parks allow visitors to glimpse life in both rainforest and cloud forest, simmering volcanoes offer otherworldly vistas, and reliable surf breaks are suited to beginners and experts alike. The best part is, given the country's size, you can plan a relatively short trip that includes it all so you don't even have to choose between the many exciting opportunities. Finding your center on a surfboard or yoga mat, descending bat-filled caves or misty volcanic peaks, or hiking, biking or ziplining through a nature-lover's paradise - there's no limit to the adventures waiting for you in this tropical oasis. With so much to see, do, and taste, Costa Rica is a great place to experience, and there are several exciting tour options available to help you make the most of your time here. See forests, fauna and fireworks on this exciting Costa Rican adventure. The jewel of Central America, Costa Rica's environment is world-renowned for being diverse, vibrant and healthy. If you're short on time but want a taste of this country's unique sights then jump onboard this express trip through San Jose's colonial streets; La Fortuna's hot springs, waterfall, and volcano; Monteverde's cloud forest; and Manuel Antonio's turquoise seas. With abundant wildlife, intense volcanic landscapes, and superb Pacific beaches, this Costa Rican adventure is sure to be a trip to remember. 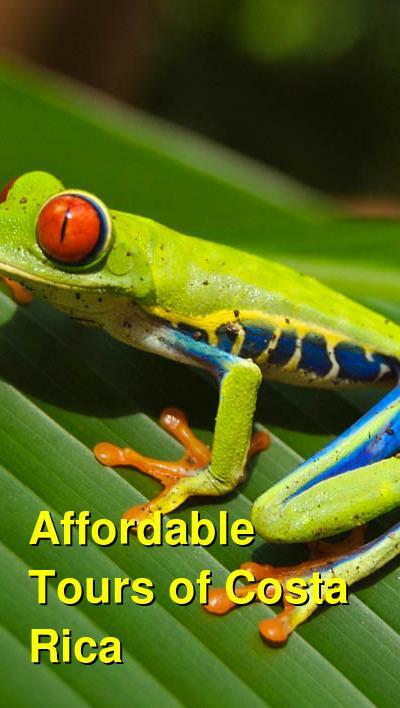 This tour is a great opportunity to experience the diversity of Costa Rica's environment. Experience all of the various landscapes from volcanoes and rainforests to waterfalls, hot springs, and turquoise waters all while making memories to last a lifetime. Spot monkeys and sloths high in the cloud forests of Monteverde and lounge on the white sand of some of Costa Rica's finest beaches. The national parks of Costa Rica are blessed with some of the greatest diversity of flora and fauna in the world. Visit Tortuguero, where you can learn about indigenous turtle catching and conservation efforts. At La Fortuna you can explore the base of the mighty Arenal Volcano from your unique perch high in the trees. Visit butterfly gardens at Monteverde's outstanding tropical cloud forest and wildlife sanctuaries. Relax on some of Costa Rica's finest beaches, with long stretches of beautiful white sand backed by lush jungle. This 15 day tour gives you the chance to see all the amazing environments and adventures that Costa Rica has to offer. Experience the country and, as the locals say, enjoy the Pure Life. Start and end in San Jose with a bicycle tour in Costa Rica. You'll have a 9 day tour package taking you through San Jose and 4 other destinations in Costa Rica including accommodation in a hotel, an expert guide, meals, transport, and more. This exclusive program is ideal for real bike lovers. Visit the most beautiful and authentic destinations in Costa Rica on two wheels. Start off in San Jose with included transfer to your hotel. Head to Arena, a perfectly formed, cone shaped volcano. Enjoy a bike ride to explore the vast rainforest in the national park via secondary roads. Continue your bike expedition toward Miravalles Volcano. En route you will feel and hear the noises of the rainforest as you bike on a paved road around Costa Rica's largest lake. Enjoy a soak in the naturally heated hot springs. From the humidity of the rainforest, to the awe-inspiring beauty of the cloud forest, you will bike across rivers, through mountains, until you eventually reach the ever-spanning canyon of Rio Liberia then get transportation to Ricon de La Vieja National Park. Take your 2-wheeled ride on a variety of different trails chasing hidden waterfalls and discovering rivers colored by volcanic activity. Zip line over an immense canyon, rappel, rock climb, and swing like Tarzan on Earth's playground. Hike the nature trails of the Ricon de La Vieja Volcano. Relax on your transfer to the white, sandy beach of Tamarindo where you will have time to enjoy the calm ocean waves. Return to San Jose where your tour concludes. Start and end in San Jose with a 6 day tour package taking you through 4 destinations in Costa Rica. Your tour includes accommodation in a hotel as well as an expert guide, meals, and transport. On this 6-day, 5-night adventure tour of Costa Rica, you'll get to experience the biodiversity found in Costa Rica, from wetlands and the Canals of the Tortuguero National Park to the magnificent Arenal Volcano region and its Thermal waters, you'll visit the breathless Waterfall of la paz. All led by bilingual guides and while staying in hotels and specialty lodging properties. Your tour includes boating, hot springs, bird watching, and other meditative pursuits. Visit the beautiful Caribbean Coast of Costa Rica and its most impressive natural wonder, the canals of Tortuguero, featuring amazing beaches, beautiful wetlands and marshes, bustling with wildlife and unspoiled natural surroundings. Hop on a boat tour to explore canals, lagoons, and wetlands inhabited by endangered turtles and manatees. Visit the magnificent Arenal Volcano region making a stop at La Paz Waterfall Gardens en route. Explore Arenal Volcano National Park's nearly 30,000 acres of misty cloud forests, petrified lava fields and the tranquil Lake Arenal. Enjoy some time in the Paradise hot springs and thermal pools before returning to San Jose where your tour concludes.